David Dunn (Bruce Willis) and his son Joseph (Spencer Treat Clark) are running a security business by day, selling surveillance equipment. By night, David dons a hood and walks the streets, believing he's the vigilante the city needs. When David gets a tip on four missing chearleaders, it leads him to Kevin Wendell Crumb, better known as The Beast (James McAvoy). While David is trying to apprehend Kevin, both are caught and because David is wanted for his vigilantism, both are sent to a psychiatric facility. There, they meet fellow patient Elijah Price a.k.a. Mr. Glass (Samuel L. Jackson). 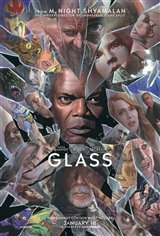 During a session with all three, psychiatrist Dr. Ellie Staple (Sarah Paulson) tries to convince them that they don't actually have superpowers. Nonetheless, Glass is intrigued by Crumb’s incredible powers so the two team up to break out of the hospital.